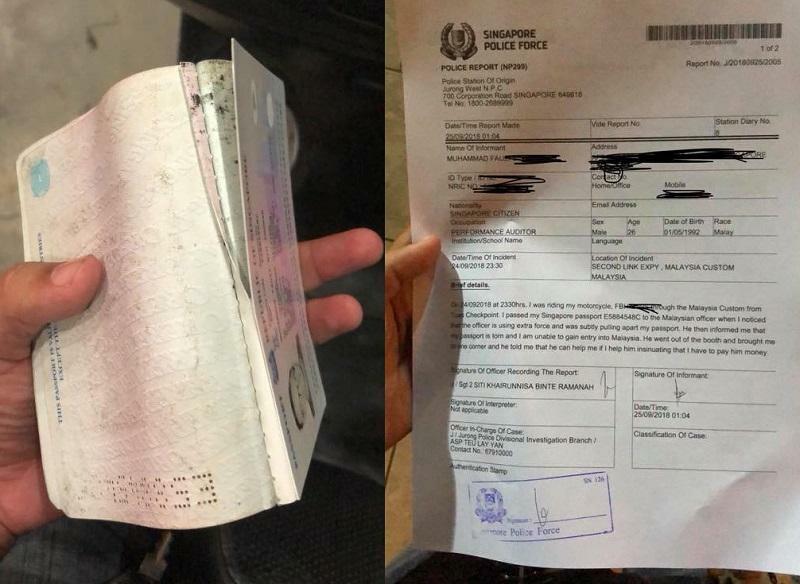 Malaysian Customs Officer Slyly Tore Up Singaporean Tourist’s Passport To Solicit “Kopi Money”; Gets Flatly Rejected Despite Threats – Sinking It In! Singaporean visitor Muhammad Fauzi recounted his shocking experience passing through the Malaysian customs when he tried to enter Malaysia on Monday night (24 September 2018). Fauzi shared how before handing over his passport, it was in perfect condition but after the customs official handled it, it was torn and unusable. Due to the torn passport the official told Fauzi he was not able to allow him into Malaysia as it was illegal but pulled Fauzi to a corner for a chat. During the chat, the customs official said that he could help Fauzi with his passport problem but only if he helped him too. However, Fauzi flatly reject his request for kopi duit (coffee money) and chose to turn back to Singapore instead. He also added that he spotted the officer using his palm to forcefully tear our his passport. Fauzi made a police report but chose not to name and shame the customs official over fears of unspecified consequences against him if he did so. I immediately told him, “tell you what, i will take back the passport u tore and I will go back to Singapore”. Man, all he did was smiled and told me to make a new passport before I can go back home. This is most ironic given how Mahathir Mohamad just spoke about how corrupt individuals must be punished and sent to jail.